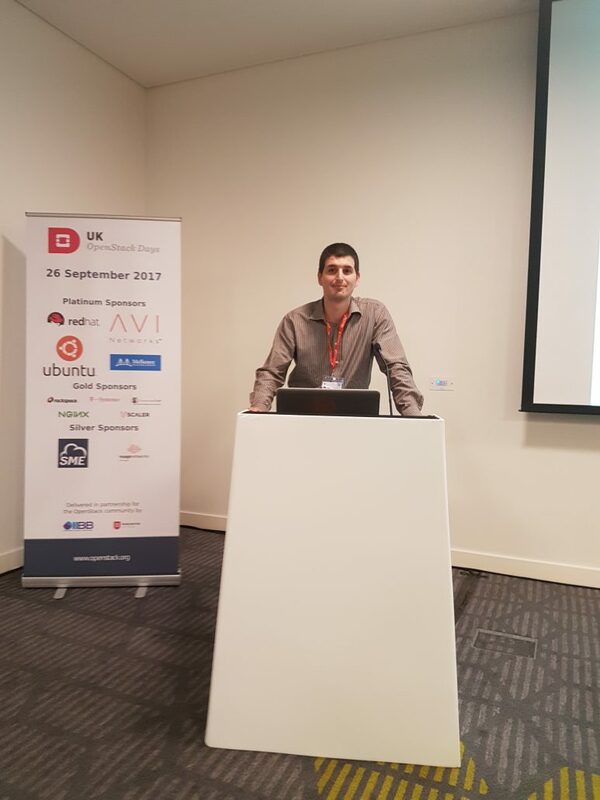 We were at the OpenStack UK Day! 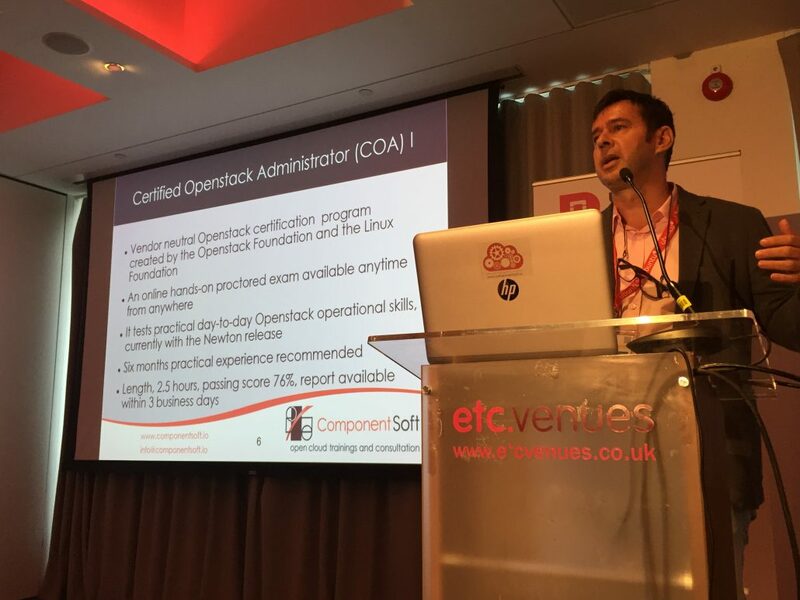 The long awaited OpenStack UK day took place on the 26th of September in London. 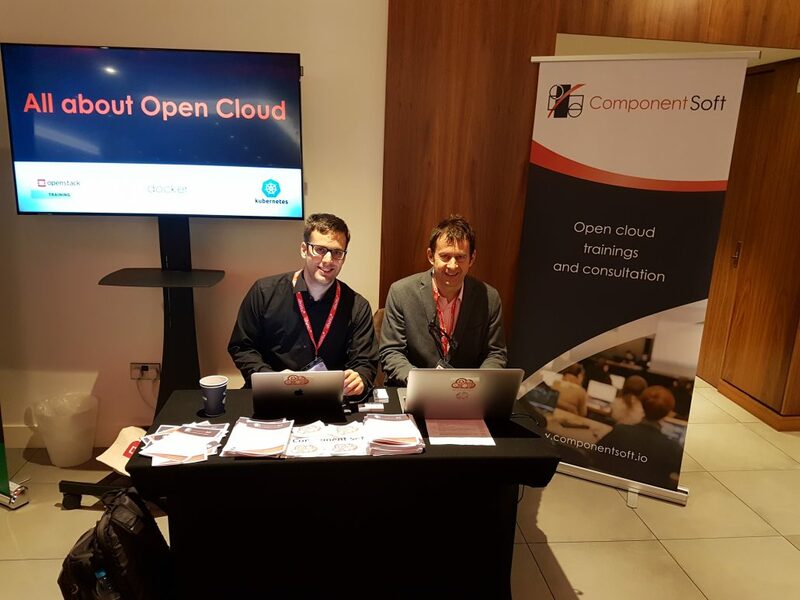 Component Soft participated in the event, as Gold level Sponsors, so we’d set up a booth to meet and greet and we also presented on 2 different topics regarding OpenStack. Our first presentation – by Csaba, our OpenStack specialist – was about using Elastic stack for logging and Prometheus for monitoring your OpenStack. Prometheus is a new monitoring tool specifically designed for cloud technologies like Kubernetes, Docker, and now OpenStack. His slides are available here. We will update this post with the video recording as soon as it is available. These tools provide a handy way to monitor and log your OpenStack’s activity, helping with troubleshooting efforts. Csaba even put together code for a test environment, that you can access here. While Csaba was busy illuminating the attendees on his monitoring mojo, I was outside in the lobby, providing information about our various OpenStack and Open Cloud trainings. Interestingly we were the only dedicated training company sponsoring the event. Shoutout to our booth-neighbours, NGINX for the T-Shirts. Our second presentation was a group effort. It was about the various official exams attached to Open Cloud technologies, like OpenStack’s Certified OpenStack Administrator, and the upcoming Certified Kubernetes Administrator exams. You can access the slides here. The first part was about the market value of these exams, as presented by Erno, our CEO. 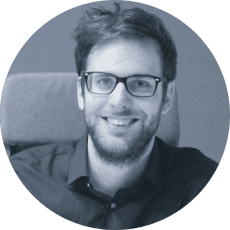 These exams seem to be increasing in value and demand, both for Open Cloud professionals in the job market, as well as companies working with these technologies, to show they have the experts to help their clients. In the second half of the presentation our instructors, Csaba and Agoston shared practical advice for these exams. 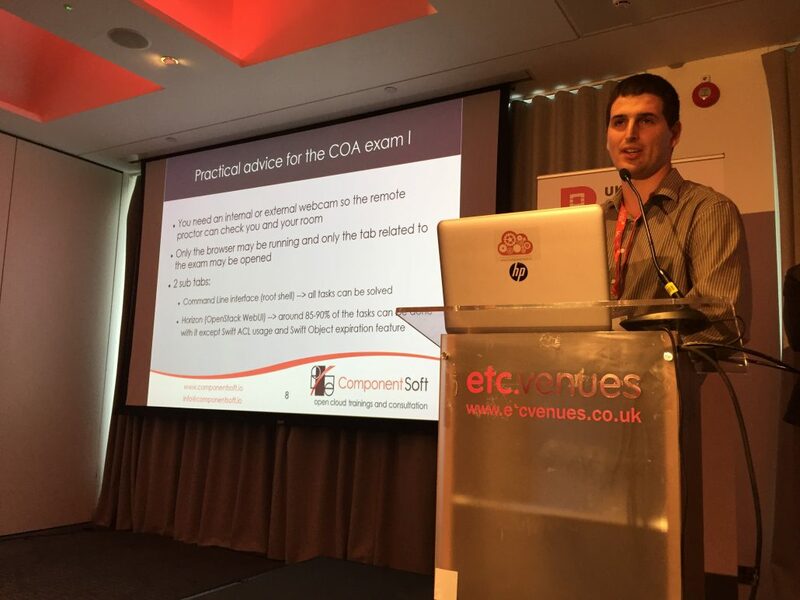 Csaba is a Certified OpenStack Administrator, and he is the brain behind our 10 tips for better chances for the COA exam. Agoston had been participating in the beta test for the Certified Kubernetes Administrator exam over the summer. The exam itself only released a few days before the conference. The conference was an amazing experience, and we are glad to have contributed our expertise to this gathering of OpenStack professionals. If you weren’t able to come, I hope you can next year! Home Uncategorized We were at the OpenStack UK Day!